Marla Weber’s second graders at Exeter-Milligan took a break from their typical regiment of paragraph writing. 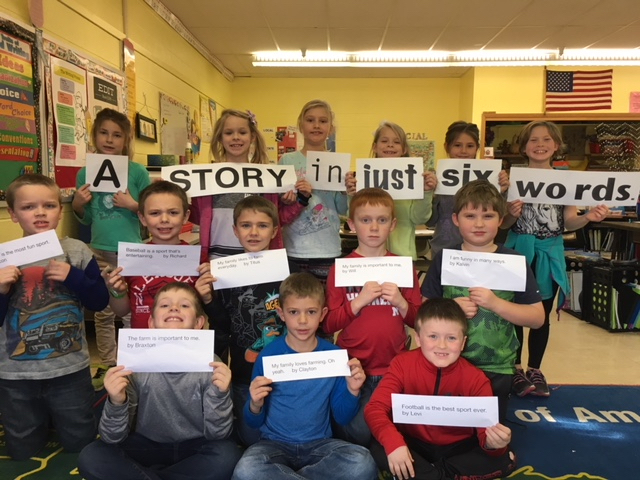 Instead, these students were challenged to write a 6-word memoir. According to legend, Ernest Hemingway was challenged to write a story in just six words. He accepted the challenge and wrote, “For sale: baby shoes, never worn.” Taking a cue from Hemingway, second grade students at EM accepted the quest. To accomplish this goal, students began by writing nonstop for five minutes; listing anything that described themselves or items in which they showed interest. From this list, students selected just two or three words they liked best. From these words, their topic was selected. Next, students wrote for three minutes about this topic; anything that came to mind. Each of these steps brought students closer to their goal. At the conclusion of this timed writing, these young writers were prepared to compose their 6 word memoir. Students learned the power of words. This challenge was more difficult than students first realized. Second grader, Titus Petersen, said, “At first I thought it would be easy to think of just six words. Then I realized I have to choose the right ones.” A story in just six words. Care to take the challenge? Middle: Deacon Erdkamp, Richard Hickman, Titus Petersen, Will Kallhoff, and Kalvin Lock. Back: Addison Foutch, Aaliyah Million, Scout Grummons, Ava Million, Natalie Meyer, and Ensley Stahl. Blind Date with a Book Coming Soon!